A National Trust appeal to raise £1 million to secure land above the White Cliffs of Dover has reached its target in only three weeks with support from more than 17,500 people. Money from the trust’s Neptune fund and appeal donations are being used to buy and restore 170 acres of land immediately behind clifftop that the charity secured in 2012. Further donations will aid conservation of nature habitat and preservation of Second World War features at the site. The site includes the D2 heavy anti-aircraft battery that played an important part in the Battle of Britain and protected the early radar towers at nearby Swingate. Dame Vera Lynn, who celebrated her 100th birthday in arch and whose 1941 song, (There’ll Be Bluebirds Over) The White Cliffs of Dover, helped fher reputation as “the forces’ sweetheart”, praised the public’s generosity. In a letter to the trust, she said: “My thanks to everyone who embraced the campaign to protect this national icon. 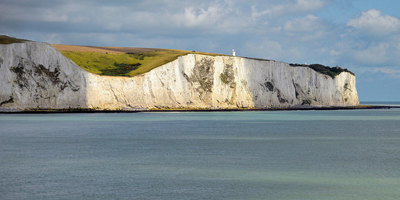 The white cliffs of Dover are a significant landmark and it is so encouraging to know that they will now be protected for future generations.